Auto Mouse Clicker is a Software Download for clicking mouse cursor according to a defined script. The Auto Mouse Clicker can be used to automate Left, Right Mouse Clicks, it even supports double mouse clicks for Right & Left Mouse Clicks. Download Auto Mouse Clicker Software Utility now and create mouse clicker script to automate Mouse Cursor Clicks. 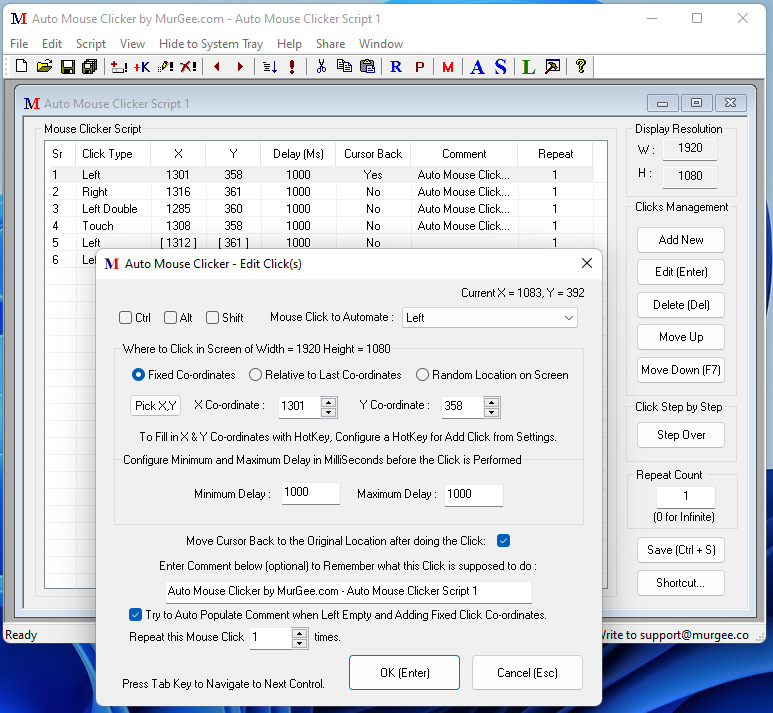 In case you would like to have a simple mouse clicker that would keep on clicking at current mouse location, then do have a look at Auto Clicker software utility. Do have a look at the main window of Auto Mouse Clicker to know how it can be put to use. As the Window is a really big one to accommodate many Mouse Clicks, the software download can be really useful in case you do have Dual Monitors connected to your computer or even if you have a monitor with big resolution. The Auto Mouse Clicker does comes with HotKey combination support and related help for trying out the software. The Auto Mouse Clicker is provided on a free to try basis. There are no limitations whatsoever in the software download except from the trial usage limits. Download and try Auto Mouse Clicker Now and check out whether it can be of help to keep the mouse clicking automatically. The Auto Mouse Clicker Software is a Software Utility which can be used to keep your mouse cursor clicking according to a defined script. The Mouse Clicker Script can be saved to a file at any location on your windows computer. In Order to Start Mouse Clicking, just double click on the Mouse Clicker script File. Given below steps outline how to use the Auto Mouse Clicker Software to use the software. Configure System Wide Hot Key Combination to Add New Mouse Click, Stop Auto Mouse Clicker and to execute Auto Mouse Clicker one step at a time. Create New Auto Mouse Clicker File by selecting File - > New Script. Minimize the software, move Mouse to the the location where you would like to click and press HotKey combination to Add New Mouse Click. Add New Mouse Click Screen will popup, select the type of Mouse Click to automate and review other Mouse Click properties and click on OK to add new mouse click in Auto Mouse Clicker. The Screen co-ordinates can be selected to be fixed or can be selected as relative to the Mouse cursor location on the screen and you can even specify how many times a specific Mouse Click must be repeated. Save Auto Mouse Clicker File to any Location on Computer. Double Click on Auto Mouse Clicker File to Start Auto Mouse Clicking. Press Configured System Wide HotKey Combination on Keyboard to Stop Auto Mouse Clicker. When Auto Mouse Clicker is clicking Mouse Cursor, it displays an icon in System Tray, double click on System Tray Icon to Stop Mouse Clicking. The Auto Mouse Clicker comes with a really big Window Size. When specifying the co-ordinates of the Mouse Click, you can minimize the software and press the HotKey combination to add new Mouse Click. The Auto Mouse Clicker runs a check of Screen Resolution when starting up. Hence in case you created a Auto Mouse Clicker script file when Monitor Resolution was 1024 X 768 Resolution and when executing Mouse Clicker script file, the Monitor Resolution is something different than 1024 X 768 Resolution, then the software will display a message prompt saying that the Monitor Resolution was different when you created Auto Mouse Clicker File. For Dual Monitor Computer, the Monitor Resolution is tracked on the basis of the size of the Virtual Desktop Width and Height. Let's say you created the Auto Mouse Clicker file with both of the Monitors enabled and when executing the Mouse Clicker, you have disabled the second monitor even then the Auto Mouse Clicker will prompt a message. You can even use our another Dual Monitor Software to control Dual Monitors using System Tray, Desktop Shortcut or HotKey combinations. Auto Mouse Click Software Download provides Mouse Cursor Automation features in a compact and small Window and Auto Typer can be used for typing automatically on Keyboard. Visit MurGee Home page to view more software downloads.